The trajectory into oversized formats taken by iconic Sydney printer John Fisher Printing (JFP) has been from the quality offset market, which remains its core – retail, pharmaceutical, publishing and agency work, as well as promotional material and direct marketing (with VDP), down to managing fulfilment and distribution. Half a decade ago, JFP embarked on a move into wide format print to cater for a wider range of its existing customers’ requirements, including banners, wraps and posters for the POS and outdoor signage markets, says Tony Fisher a JFP director. The fourth-generation printing company, founded by Tony’s grandfather John Fisher 63 years ago and run for many years by his son, well known industry personality John N. Fisher, moved to 2200sqm premises at Marrickville, with Tony in sales & marketing, his brother John a litho operator, and cousin, Toby Friend, as a director managing operations of a loyal & experienced production team. In addition to its offset printing, it offers an array of wide-format display work for interior & exterior displays, including small run specialty boxes, corflutes, backlits, posters & banners up to 3.2m wide, re-positionable window decals & wall fabrics, direct print to floor graphics, street signage and one-way vision. “We were outsourcing a growing quantity of wide format work to the trade and wanted to bring it in-house, to be able to print beyond the A1+ format of our offset machines. We researched the wide-format inkjet market for around six years and noticed the breakthroughs in speed and quality were quite dramatic,” Fisher tells ProPrint. 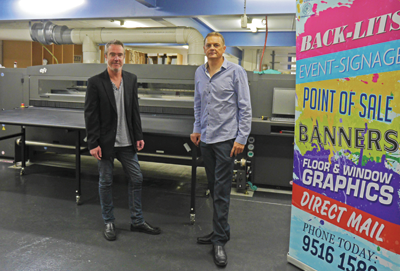 Both factors were a must for JFP, and the company invested in its first VUTEk, a GS3200 hybrid roll/flatbed UV, with the hardware from EFI and the prepress, including colour calibration, from DES. It has since ordered a LED-curing VUTEk GS3250LX, which enables printing on lined corrugated boards. Both are eight-colour machines with an opaque white capability. In flatbed mode, the GS3200 and GS3250LX can print on up to 50mm-gauge, which opens up new opportunities for JFP – such as printing on MDF, melamine benchtops, doors and x-board product. “The GS3250LX gives us the ability to print to corrugated boxes, films as thin as a ‘human hair’ to reflective mirror, rubber matting, as well as wood veneer products, floor & wall covering, safety signage & yes we can even print to bubble wrap! The possibilities & applications are extremely exciting,” says Fisher. The two VUTEks complement JFP’s offset line up, a five-colour A1 Mitsubishi with inline aqueous coating, a half-size Heidelberg Speedmaster, a two-colour SM52, a Cylinder, diecutting and a Polar cutting line. “Our digital press operator was trained up for the VUTEks, so there was not much of a learning curve, but any pre-press personnel can adapt their existing skills & with a little training, wide format printing can easily be added to their skill set” Fisher says. He estimates that 75 percent of JFP’s burgeoning wide-format work is ordered by existing litho customers. "We are also undertaking a marketing campaign to expose our expanded services in visual graphic displays & to make old and new customers aware of the company’s unique & growing capabilities”.